This frame from Gogeta is seen in Dragon Ball Super Broly. Being Gogeta a fusion of Goku and Vegeta, one would think he should be able to access to some of them, combine them or use a new transformation. 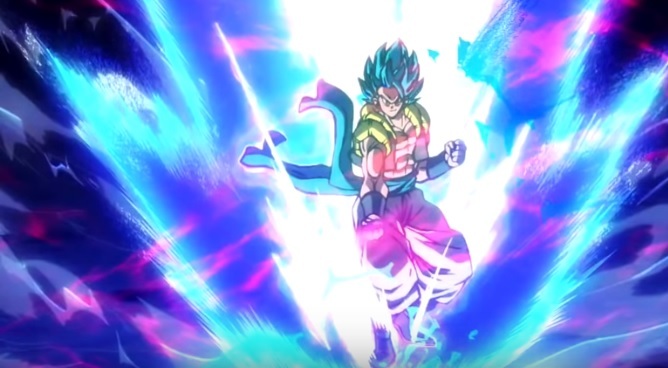 Is this state regular super saiyan blue, one of the former super saiyan blue upgrades mentioned above or a new transformation? Does Gogeta have a new transformation in Dragon Ball Super Broly? The Dragon Ball Super movie has a completely different art style compared to the anime. This is similar in comparison to what was said about the Super Saiyan Blue forms used by Goku and Vegeta. There was a lot of speculation that Goku and Vegeta were supposedly using a new version of Super Saiyan Blue, possibly Mastered Super Saiyan Blue against Broly. However, it was just the regular Super Saiyan Blue transformation with a new art style where the hair color seems to look darker. The transformation Gogeta is using here is clearly Super Saiyan Blue. We see this based on the color of his hair. The different art styles and the superior animations in the movie compared to the series, makes it appear that way. Even Xenoverse 2 just put out a trailer with Super Saiyan Blue Gogeta. Also Note: According to new arc of DBS in the manga, Goku tells Vegeta that he hasn't been able to use Ultra Instinct even once after the tournament of power, plus, MUI has silver hair and UI Omen has the special aura with regular hair and Gogeta clearly has Blue hair here. Secondly, the hair for the SSBE transformation is a lot darker. You can look at this photograph here, of SSJB and SSBE side by side. Nevertheles, there is definitely evidence according to Spoilers that Gogeta fights Broly in Base, SSJ and Super Saiyan Blue. Hence, the form being used here is Super Saiyan Blue. Firstly, regarding the picture in this thread, could it not be gogeta combining 'Super Saiyan Blue Evolution' with " SSJB Kaioken x 20"? In the fight sequence before this you see gogeta potentially using SSBE as he avoids brolys blast and then see flashes of red in his aura when he attacks. In an unrelated comment, when Goku transforms into SSJB you see a flash of MUI. This could mean the form may be accessible in the anime later down the line. That's my two cents on it anyway!